New Tasmanian laws to ban smoke are a joke and out of touch with reality. While the rest of the world goes on its merry way it will have no positive effect. Diesel trucks pump tonnes of filth into the atmosphere and there is no legislation to stop them. Not only will the new rules stop gardeners from burning waste vegetation, barbecues will be monitored as well. Recently a new type of barbecue has been released called the "turbo" or "low'n'slow" which increases the flavor of meat by creating more smoke. Ban criteria are just pulled out of the air. Smoke should not be visible for more than 10 minutes continuously. A fireplace cannot give off smoke for longer than 30 seconds. How are you going to stop burning wood from constantly giving off smoke? Fines are extremely large - $1,600 for the first offence. This is bureaucracy gone mad. If you are having problems with a neighbor they can make your life hell by reporting you for every fire you light and every time to use a barbecue. The law is one sided. Forestry burn-offs are exempt. It seems that a farmer can do what he likes. There is an issue of nature. When you light a fire the wind could be blowing from the east. An hour later it could blow from the west, right into the troublesome neighbors backyard. Barbecue smoke regulations in Tasmania are un-Australian. New cutoff points on smoke made by backyard barbecues in Tasmania are a joke and un-Australian. The Tasmanian Government is bringing in draft smoke laws that lessen the quantity of landholders permitted to set fire to vegetation and wood-heaters. The laws would make it simpler to fine individuals if their barbecues create excessively smoke. The Tasmanian BBQ Society stressed the proposed new directions will hurt meat cherishing Tasmanians. President Rowan Peterson said, "When you're discussing the measures of smoke that the limits allow and contrast it with the Australian lifestyle, the barbecue, it is a joke," . Barbecues have turned out to be a huge business as of late. Some new models portrayed as "turbo". 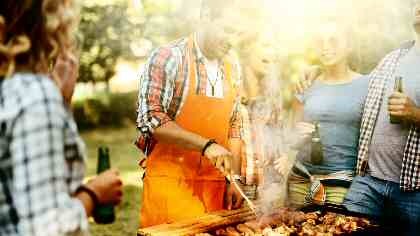 The surge in prevalence has seen barbecues achieve the cost and size of a small car, as high a $6,400. Some are advertised as "turbo" the "low'n'slow", Which creates volumes of smoke to flavor meat. (b) amid that ceaseless 10-minute time span is unmistakable for a persistent time of 30 seconds — (I) on account of a warming apparatus or chimney in a building, or part of a working at a separation of 10 meters or more from the point on the building, or part of the building, where the smoke is transmitted; or (ii) on account of a heating appliance or outdoor cooking and heating apparatus or fireplace that isn't in a building, or part of a house — at a separation of 10 meters or more from the where the smoke is radiated. That is from a separation of 10 meters, or as Mr Peterson fears, from the opposite side of a pernicious neighbor's fence. "In the event that you have a dreadful neighbor as well as a testy individual that lives in your road, it's only a dubious contention that they can use to cause more problems." A great part of the Draft Smoke Act isn't new and is a revamping of the 2007 tenets. What is new is the ability of council officers to exact fines of two penalty points when fires defy smoke guidelines and the power for justices in the courts to set maximum fines of $1,600. "There's such a significant number of types of barbecue that identify with societal cultures in Australia. "Not exclusively does it influence the backyard bloke doing snags and chops, it will impact influence anyone wanting to cook outdoors. Partner Rowan Armitage said regulatots ought to hit the big end of town". "How much harm does 500 grills on a weekend do contrasted to forestry burn offs. Social media was alive with protesting residents. "I can be fined as much a they like, but I am still having a pleasant smoking BBQ, except a total fire ban,"Quinton Turner said. "Sod off fun police, mozzies do not like a smoking BBQ," Brendon Nowak said. Environmental Protection Authority has put the paper out for public discussion..
Director Wes Ford said the guidelines were open for review. Individuals should submit sugestions to make barbecues exempt. He said the directions planned to lessen smoke in urban residential zones. "The draft directions don't boycott anything, what they look to do is oversee smoke from fires and barbecues where the smoke is truly affecting neighbors." "It is not about being un-Australian, by the day's end barbecues cause smoke." Under the alterations council officers will usually make fines of $320. "It implies that local government environmental halth officers can make on-the- spot environmental infringement notices instead of going to court." CEO Katrina Stephenson said it would not be easy to enforce as barbecues usually take place on a weekend. The Asthma Foundation said it was welcome to get any decrease in smoke levels.